Before I started promoting Clickbank offers, I have watched many videos on YouTube and have read posts on internet marketing forums. I tried to get a birds-eye view of what others are doing. Finally, I started promoting Clickbank offers that had high gravitates. I started with Bing Ads. At first, I used a domain that redirects to clickbank hop-link as the final URL in Bing Ads. But, the ad got disapproved. While talking with Bing Ads rep, I realized that I cannot redirect traffic to Clickbank offers directly. I need to direct traffic to a landing page first and then direct traffic to clickbank offers. So, I got a domain, created a simple landing page and added that domain as the final url in my ads at Bing. I talked with Bing reps again. They told me that it is against their policy to use landing pages that does not add “significant value” to the visitors and that are used only to redirect visitors. So, I changed my landing page and edited my ads. Finally, my ads were running. Then I started to use Google Adwords platform. Using the same strategy of Bing ads, I created several campaigns. Soon, the clicks started to come through. Over the next few days, 100+ visitors hopped to my Clickbank affiliate offers. But no sales. “There must be something that I am doing wrong”- I told myself. I started promoting more Clickbank products. But this time I targeted the products with lower gravity. And I moved away from weight loss products. I also started to target UK, Canada and Australia, whereas I mainly targeted US earlier. I ran the ads for several days and .. The next day, I got another! Then, I got 2 sales and 2 upsells on the same day. I do not promote offers with very high gravity. Although there is high demand for such high-gravity products, there is very high competition for those products and relevant keywords, as well. And there are many super-affiliates involved with those products and they are very difficult to compete with. I tend NOT TO promote weight-loss offers. There are so many products in this very lucrative niche and so many super-affiliates involved that it is very hard to make profit. You need to have your game figured out absolutely to compete in this niche. I use squeeze pages only for those offers that convert well. 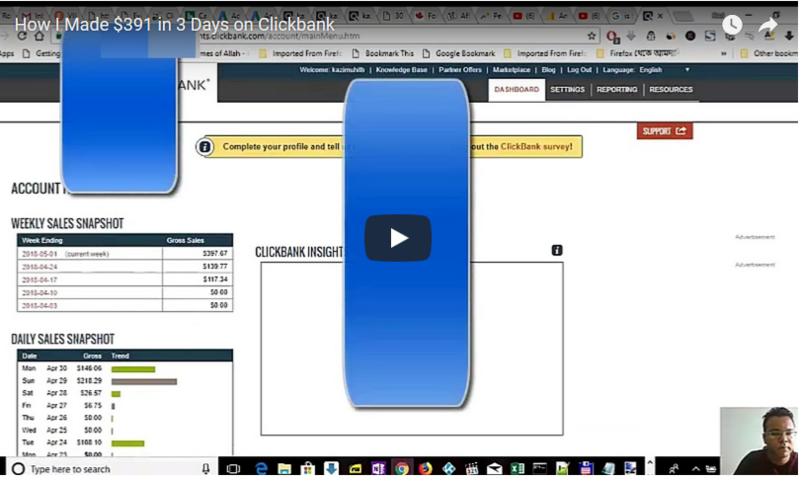 I start with a normal landing page that directs visitors to Clickbank offers through “watch now” or “get instant access” button without email capture. Whenever I see that an offer is converting well, I replace the normal landing page template with a squeeze page ( email capture page) template and connect it with my Aweber (auto-responder) account. I used many twists and tricks that paid great dividend… you can find out inside!